If you have ever worked as or with a doctor, you’ve probably encountered something called a multi-source feedback form, or a “360 appraisal”. It is part of the process for junior doctors to progress to the next stage of our training, and is often a valuable tool as an anonymous insight into what our senior doctor, nursing, and allied health professional colleagues think about us, both good and bad. On my most recent feedback form whilst on a rotation outside of the emergency department, there were two comments with mention that I was bordering on overconfidence. The rest of the feedback was very positive, but it was these comments that really stuck with me. I wasn’t sure what I was doing to give the impression of overconfidence. Was I actually overconfident? How would I know? What could I do to improve? And really, the most important question – was it affecting my patients? This post brings together my reflection over the last few months. It’s important to be aware that confidence can be a good thing. In an emergency situation, for example, you want to know that the team leader has control. If they appear confident, they instil confidence in those around them, and this can make the team work more effectively and efficiently towards a common goal. Confidence is formed with knowledge, and gained with experience. It can fluctuate; you may have had a run of successful, first pass lumbar punctures, but fail one and your confidence diminishes. This can affect how a situation is managed the next time it presents. The more experience you gain in a particular setting, the less likely it is that your confidence will shift in this way. A consultant anaesthetist is unlikely to be fazed by a failed epidural, but a junior trainee may be – particularly when the consultant then proceeds to make it look easy! Overconfidence is an excessive belief in something succeeding, without any regard for failure. This can lead to mistakes. An overconfident person can be so focused on the path that they are taking, that they are blinded to other possibilities, also making it more difficult for other team members to challenge decisions. They might miss clues that point towards a different answer. Confirmation bias can play a role here, as they may be more actively seeking evidence to back up their conclusions. Poor follow-up can reinforce behaviour through not knowing whether the right decision was made. Arrogance takes this a step further, involving active dismissal of others’ opinions, and lack of humility. It also differs from overconfidence in that usually the person is competent, whereas in overconfidence their confidence is greater than their competence. The line between confidence and overconfidence is fine. Too confident and your team may feel they can’t challenge you and mistakes might be made. Important details may be missed, lessons not learnt for the future. Not confident enough and you may lose faith in your own decisions, or not attempt something due to fear of failure. The line is also difficult to define as it is largely based on the perceptions of other people. A more experienced person may be able to spot overconfidence in a colleague, where others with less experience just see confidence. Does it exist in medicine? Of course. Doctors are no less vulnerable to overconfidence than the rest of the population. Unfortunately, due to the nature of the job, errors made by healthcare professionals can have life-changing consequences for the patients. A review of the literature by Graber and Berner (pdf) in 2008 found that diagnostic error exists at a rate of less than five percent in perceptual specialties such as radiology and pathology, but that this can rise to 15% in others. Overconfidence is a contributing factor; studies reviewed by the paper found that physicians often don’t use available information resources to aid diagnosis, and where guidelines or protocols were in place to manage specific conditions, these were only followed around 50% of the time. Physicians know that error exists, but seem to believe that it is less than it really is. Despite an error rate of around 5-15%, research by Friedman et al. comparing confidence and accuracy in diagnosis by medical students, residents and attending physicians gained some perhaps unsurprising results. The medical students were the least confident and accurate, the attendings the most, and the residents were more confident but less accurate than their attendings. 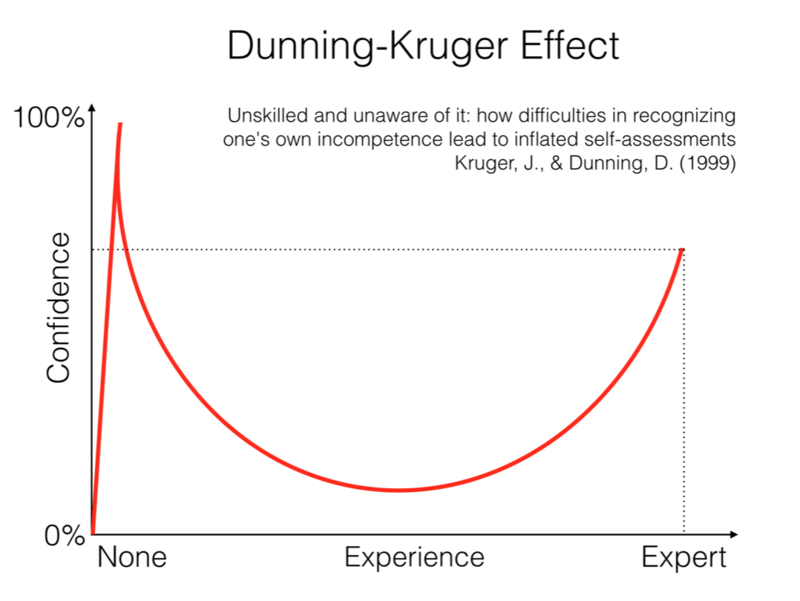 We have seen this highlighted before in the Dunning-Kruger effect where less skilled individuals overestimate their ability. In the emergency department, decision making is complex. Time and resources are limited, the environment is busy, and physicians are often looking after multiple unwell patients. In many cases, a diagnosis may not be made, and the decision comes down to whether the patient needs to be admitted for further management, or discharged home to benefit from time passing with the potential for follow up at a later stage. In such instances, the issues surrounding confidence do not reflect confidence in a diagnosis, rather on where the patient should go after they leave the department. It is rare that we get feedback though. The patient we send home today may well return tomorrow. If something bad happens, we might hear about it in one of those heart-stopping “do you remember that patient you saw last night?” conversations, but due to the varied shift nature of the emergency physician, it’s unlikely we will be there to see them the second time around. If we don’t hear anything, it is easy to assume that what we are doing is right. We become more confident in our management, but that doesn’t mean we are right. Often we will seek advice on unusual presentations, but we can become overconfident in the routine. How can we avoid the dangers of overconfidence? Being aware of the extent of your own knowledge and skills is valuable. It allows identification of gaps in knowledge, and therefore the potential to fill these. If you do something often enough, and nothing bad happens, your confidence is increased. Incompetence is also reinforced, leading to overconfidence, and it may be that one bad outcome is viewed as “unlucky” despite the fact that actually you were lucky the rest of the time. Continue to learn. Minimise the unknown unknowns. A second opinion is useful to either confirm or correct an initial diagnosis. This can be gained from a more senior doctor or a specialist. The latter is done whenever we refer a patient into hospital, but how many times do we actually find out what the specialist thought? Without knowing the result of the consult, confidence increases in our management of the patient, whether it was right or wrong. For those of you that are the senior opinion – create an atmosphere which enables advice to be easily sought. If you don’t know whether your diagnosis was the right one, you can’t change your practice for the next patient you see. Make a note of patients where you were sure, unsure, had to ask for help, where you had to be honest with the specialty you referred to and say “I don’t know what’s going on, but this person is unwell and needs admission”. See them on the ward the next day or find the ward doctors and ask what happened to the patient. What treatment did they give, what could have been done differently? In emergency medicine, the majority of the time you don’t get closure in the department, so it’s important to seek this out later on and compare how confident you were with the eventual outcome. Be it immediate feedback on a case from a senior, or more generalised feedback from the team as a whole in a multi-source appraisal, one of the most useful determinants of confidence against overconfidence is how you are viewed by others. Ask for it often, meet with your supervisor regularly, and utilise anonymous observations from a wide range of colleagues to inform your clinical and non-clinical practice. Once you have your feedback, process it, then think about it again a few days later. Some situations are emotional, stressful, and advice from colleagues can get lost at the time. 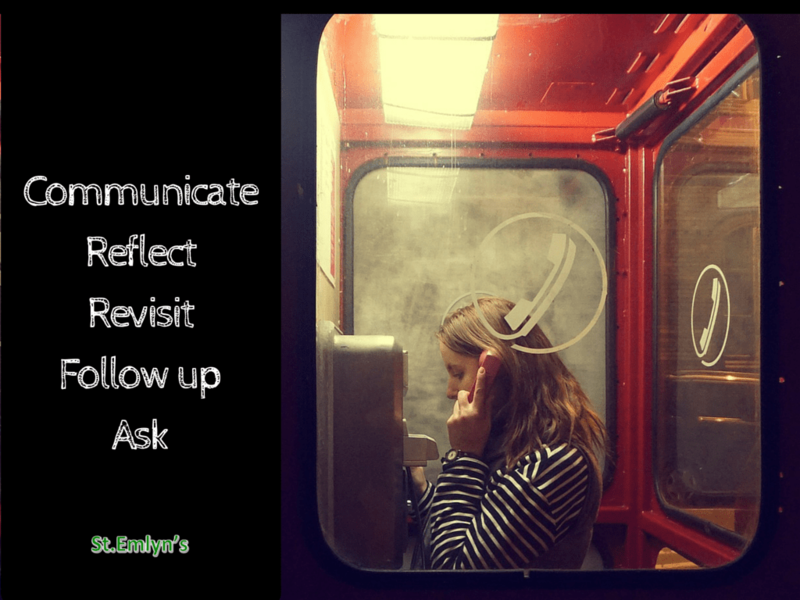 Going over the event and the feedback you received a few days later can make it easier to take on board, and easier to reflect on. This could be done on your own, or with a colleague. The feedback process has helped me to be more mindful of how I make management decisions for my patients. I’m more conscious of my ability to make mistakes, and measures I can employ to try to minimise overconfidence, without taking it too far and losing confidence. I know there will still be times when I’m more confident than I should be, but hopefully will be able to recognise this when it happens. Graber and Berner’s article in the American Journal of Medicine on overconfidence and diagnostic error. Simon’s post on making good decisions reinforces some of the learning points discussed here. Atul Gawande’s article on the decline of the autopsy in The New Yorker. This great podcast questioning how you know if you’re any good at teaching over at iTeachEM/TTC (featuring Nat and Simon) considers some ideas also applicable to assessing your clinical practice. Subscribe to the blog (look top right for the link). Follow us on twitter @stemlyns. Find out more about the St.Emlyn’s team. Wonderful post, thanks for bringing up this important topic. I agree with most of what you’ve said, but in the end it all boils down to humility. They key to avoiding overconfidence in the face of recurrent success is to constantly remind ourselve that, no matter what our mothers may think, we are not perfect. There are holes in our personal knowledge and even the best EBM tools have miss rates. Applying knowledge and experience while being mindful that we could always be wrong – even in the simplest cases – supports a more open thought process and will always keep one grounded. Important post for all (regardless of experience). The moment you stop reflecting on whether you might be acting outside of your scope of practice is the moment you risk becoming overconfident with subsequent deleterious impact on patient safety. “Am I safe to perform this procedure?” (or “Is this doctor safe to perform this procedure?”) brings together both skill set and attitude.